Lock-n-Load – Weapons & Tactics is a sourcebook for the military sci-fi / space opera system Battlelords of the Twenty-Third Century published by SSDC and written by Lawrence R. Sims. Weapons & Tactics is the second half of the Lock-n-Load sourcebook for Battlelords of the Twenty-Third Century. This book contains, of course, weapons – lots and lots of weapons – along with some game-play tactics. How many weapons you ask? I’m afraid to count, but there are 42 categories and some of those have several sub-categories. Before you think “this is too much”, know that this isn’t a redundant listing of weapons that are much too similar. The weapons list is not only quite vast but there is quite a large variance of weapons providing players with the ultimate list of choices (and exotic opportunities) for their characters from the day they are created to the day they are retired (as PCs). Overwhelming? Maybe a little. But within these pages lies an option for every possible character and player type. Weapons, weapons, and more weapons. There are so many weapons listed here that it’s too much to count. The good part is they’re presented in a way that’s easy to read and easy to understand (pending you understand the system). This section starts with the many, many tables containing the core mechanics surrounding the different weapons followed with the tables for the corresponding ammo. Following these stacks of tables is a section dedicated to describing each-and-every weapon. Yes, that’s correct, there is a description for every single weapon PLUS an overview description of each weapon group (basically flavor text). There is also a smattering of illustrations showing how some of the weapons look (mainly to accentuate the different weapon groups). While this is a bit overwhelming, the charts and the descriptions have page references back to each other. The tactics section of Weapons & Tactics contains a grouping of optional advanced rules designed to add (what I see as) cinematic appeal to an adventure or campaign. Some of these are simple enough such as the rules for cover and stance while others are much more involved like the rules for knockback. These are great options for creating realistic combat scenes for military sci-fi games. Space opera games would probably get bogged down using these optional rules, but then again they are completely optional. As they are advanced rules (in every sense possible), they are excruciatingly detailed to cover almost every aspect of their use. This is done in a very easy-to-read fashion by breaking down these different aspects into individual “bullet points” (not literal bullet points). This is a great way of explaining the advanced rules in the simplest terms possible, even though they are not simple in nature. One thing to note, is that some of these are very advanced rules and those unfamiliar with this type of combat may get very confused. While the overall presentation and illustrations look fantastic, I’m not a huge fan of the layout. When looking for a certain weapon, there are two sets of charts to check – weapon and ammo – and then you have to flip through the pages to find the descriptions of each. This activity is made faster by adding page references to both the charts and the description pages giving the reader the quick index as to what page to turn to. However, a grouping method of layout may be easier to use with each weapon group having its own section containing the weapons and ammo charts along with the descriptions. This could alleviate a large amount of page-turning and connect the description and mechanics better by placing them within the same section (and within a few pages of each other). I don’t really consider the weapons selection to be mechanics additions, although the new types of options (or enhancement of the options) added to the weapons is a definite mechanic enhancement. This takes even more advantage of the Battlelords of the Twenty-Third Century system. However, the biggest enhancement to the mechanics is the option advanced rules. While they are not necessary in some campaigns, they definitely add a great amount of flavor and really bring-out that military sci-fi aspect of the system. When reading through these advanced rules I could actually picture the action that you see in the movies. Any sourcebook that adds additional options to those that are already present is worth looking into. One that adds new mechanics (even if they’re optional) is a great addition to the system. Especially if those new mechanics make the game more exciting (pending you’re playing that type of campaign or adventure). In a game filled with military sci-fi potential, you can never have too many weapons to choose from. The value add is primarily for military sci-fi adventures and campaigns. 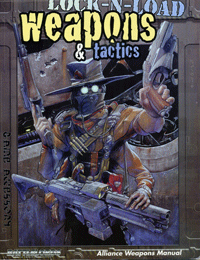 I know I already stated it, but if you’re running a military sci-fi adventure or campaign then Weapons & Tactics is a definite must have. If you’re running Battlelords as space opera, then it may not be necessary. I doubt you will ever need to search for another weapon again. And reprinting the already available weapons means you won’t have to search through two (if not more) books for these weapon options. One thing that needs to be added is that these charts and descriptions are easy to read and reference making actual usage of the book that much simpler. Most of your time will be spent trying to figure out which weapon you really want to buy! Infinity GM Screen & Code Infinity Release! Elite Dangerous Core Book, Plus PDF Supplements and Virtual Box Set all Released!